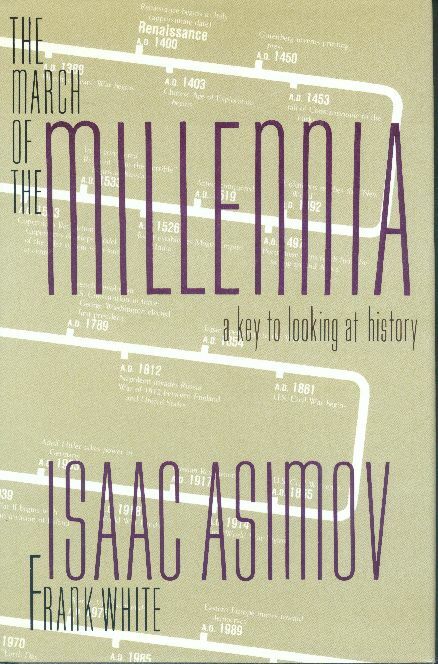 As we near the new millennium, Isaac Asimov, internationally acclaimed futurist and author, gives us a concise overview of the major trends events, [sic] and personalities of world history, millennium by millennium, from 8000 B.C. to the present…and beyond. Asimov uses this information in an innovative framework for thought, projecting what may lie ahead for us. In The March of the Millennia, Asimov provides a new key to understanding our past history and future. How will people adapt to continued increases in the Earth’s population? What are the long-term environmental problems that we face as a planet and what, if anything, can be done about them? What role will the computer play in our personal lives? Asimov, with the able assistance of space specialist Frank White, addresses these and many other questions. The March of the Millennia combines a readable chronicle of the past with a tantalizing glimpse of the future. This unique volume features a comprehensive timeline extending from 8000 B.C. through A.D. 3000. A must for all Asimov fans and for anyone who is interested in the future of our planet. This book offers a surprising and refreshing perspective in looking toward the year 3000. As a general rule, it’s pretty easy to tell what’s going on with Asimov’s non-fiction collaborations. Early on in his career, books like Races and People and Planets for Man are pretty much “by” Asimov, with at most minor touches added by the collaborator, whose name was tacked onto the book to help sales. Late in Asimov’s career, the opposite was true: Asimov was added as the “presenter” for books like From Harding to Hiroshima or as a collaborator for Robots: Machines In Man’s Image to help sales, while the collaborator is really the one who did most or all of the writing. In cases like Robots: Machines in Man’s Image, it’s also pretty obvious just how much of the writing is by Asimov—Chapter 1 is by Asimov, and everything else by Karen Frenkel. This is a case, however, where I’m really not sure how the work was divvied out. Asimov talks about this book (giving it the title The Next Millennium) in I. Asimov: A Memoir (chapter 160), where he claims full credit for writing it. And the style of the book is certainly Asimov’s all the way through. So what did Frank White do? It appears that he just did the timeline in the front and back endpapers. I’m not sure. Anyway, it’s a good book, a very nice history of humanity from 8000 B.C. through the present. Of course, there’s only so much detail you can go into with about 150 pages dedicated to 10,000 years, so it’s definitely on the breezy side. And I tend to be annoyed by the old-fashioned romanization Asimov uses for Chinese names—pinyin is the system all the hip people use nowadays—but that’s a minor, minor quibble. I’d certainly have no qualms recommending this volume to anybody, and I only mark it down because it isn’t quite as good as Asimov’s other world history: Asimov’s Chronology of the World.